You really can make an exceptional income from businesses you walk past every day. 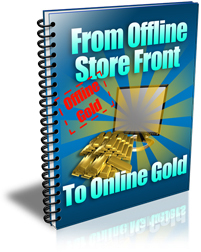 After you enter your details in this form you'll also be given a chance to purchase the groundbreaking report Offline Gold For The Online Marketer at a special reduced priced. 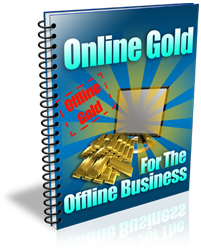 Offline Gold for the Online Marketer is a report that explains how you can make an excellent income selling online marketing services to local businesses. Many people who read this report have made $500, $1,000, $1,500 or more their first day talking to business owners. This 43 page report reveals a step by step system for turning an offline store front display into a long term online cash stream. You can charge brick and mortar businesses $500+ to explode their sales from walk past traffic. 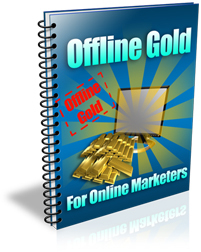 This definitive ebook on how to use online marketing to power up the profits in any brick and mortar business is the perfect companion to the Offline Gold report. With 34 chapters of cutting edge strategies for combining online and offline marketing NOTHING on the market compares to this unique resource manual.